Happy Monday friends! I hope you all had a great weekend. We spent it relaxing, getting things around the house done and enjoying the quiet time- which was so nice! 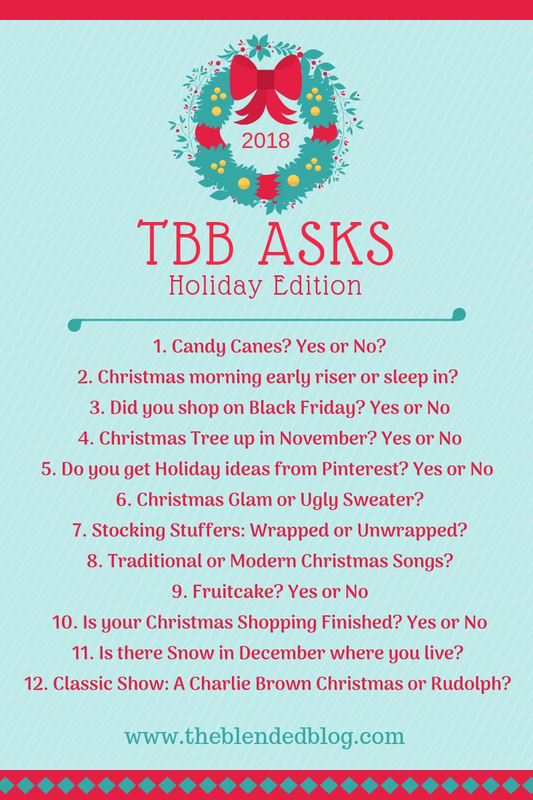 Today I'm linking up with The Blended Blog to share a little Holiday Q&A. I hope you join me, and let me know one of your answers in the comments! 1. Candy Canes? YES, love them. Reminds me of my childhood! 2. Christmas morning early riser or sleep in? Whatever the kids do- last year we slept in, and I'm sure as Bella gets older we will be up earlier! 3. Did you shop on Black Friday? From my couch only- not worth going out in those crazy crowds! 4. Christmas Tree up in November? Yes, the main tree goes up after Thanksgiving and my coffee tree is usually up a few weeks before that. 5. Do you get Holiday ideas from Pinterest? Sometimes I do- especially thinks to make for gifts. 6. Christmas Glam or Ugly Sweater? Christmas Glam, I love dressing Bella up too! 7. Stocking Stuffers: Wrapped or Unwrapped? Unwrapped- it's how I did it growing up, so that's how I do it now! 9. Fruitcake? Nope. Never had it! 10. Is your Christmas Shopping Finished? No way, I wish. I'm much closer though! 11. Is there Snow in December where you live? I live in the snow capital- Erie, PA, so of course ha-ha. 12. Classic Show: A Charlie Brown Christmas or Rudolph? A Charlie Brown Christmas! I love them both, but Charlie wins! Have a great week and enjoy all it has to bring, see you back here Wednesday!